President Trump delivers State of the Union Tuesday; Federal Open Market Committee (FOMC) decision Wednesday (no change expected); Manufacturing and Employment data should be strong. There is plenty of good feeling about growth these days. Recently, the International Monetary Fund bumped their ’18-19 world growth forecast 0.2% to 3.9%. This is higher than our assumption of 3.4% growth. Domestic growth forecasts are also strong. The Federal Reserve Banks of Atlanta and New York see first quarter real U.S. growth at 3.4% and 3.1%, respectively. These are some of the best growth numbers we’ve seen this cycle. This week will likely bring even more good news. Thursday’s Institute of Supply Management’s report on domestic manufacturing should be a solid one, and Friday’s January employment report should also be strong. President Donald Trump will no doubt heap praise on the economy’s performance during his Tuesday night State of the Union Address. And while the Fed will not likely hike rates when they meet this week, they must incorporate the latest trends into their outlook for rates. Beneath the surface, however, three important shifts are playing out at the same time. Monetary policy in the U.S. is growing less accommodative; fiscal policy here is becoming more expansionary; and trade is moving toward center stage. Monetary Issue: We are not surprised to see the Federal Reserve continue along a tightening path given the momentum of the economy and reduced slack. The combination of reduced slack, a fiscal push (think tax cuts and larger deficits), and accelerating growth argue for more tightening ahead. A risk case for central banks might be if markets “get out in front” of policy changes. If this were to happen, it could make it difficult for central banks to dictate the pace of policy change. Fiscal Issue: In our view, the near-term impulse from tax cuts on growth is a clear positive, especially investment. With withholding tables set to change later this month, we could begin to see growth strengthen further. At the same time, we expect to see increases in the fiscal deficit. The combination of faster growth and rising deficits could prompt more concern about “overheating”, requiring a more aggressive set of rate hikes by the Fed than currently expected. Trade Issue: The announcement of new tariffs and quotas on washing machines and solar panels last week sent a message about trade. 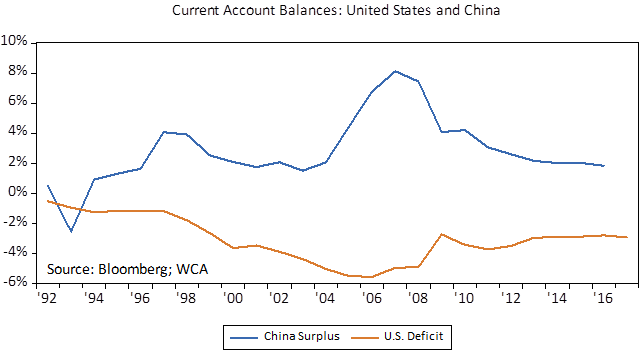 In our view, this issue is best seen in the context of an ongoing rebalancing of trade and capital flows with China (chart, below). For years, China has exported excess savings to the United States and we have exported demand to China. This is not a sustainable or healthy long-run growth plan for the globe, in our view. While the headlines of last week’s announcements focused on washing machines and solar panels, the real issues run far deeper. A long-running period of easy monetary conditions, elevated valuations, and important shifts in global economic policies remind us that risk is not vanquished. For now, we will focus on the improved growth trajectory ahead, but we must balance that optimism with a dose of realism.